There's something about the air in autumn that makes me want to go clad in all-black. Maybe it's caused by the changes in the light and the colors of the trees, or maybe it's the shift in attitude, a desire to finish the year strong while also harboring a sense of nostalgia that ultimately comes with shorter days and cooler nights. My mantra then, for my favorite season, is to be bold, go easy, and do more, but feel effortless. 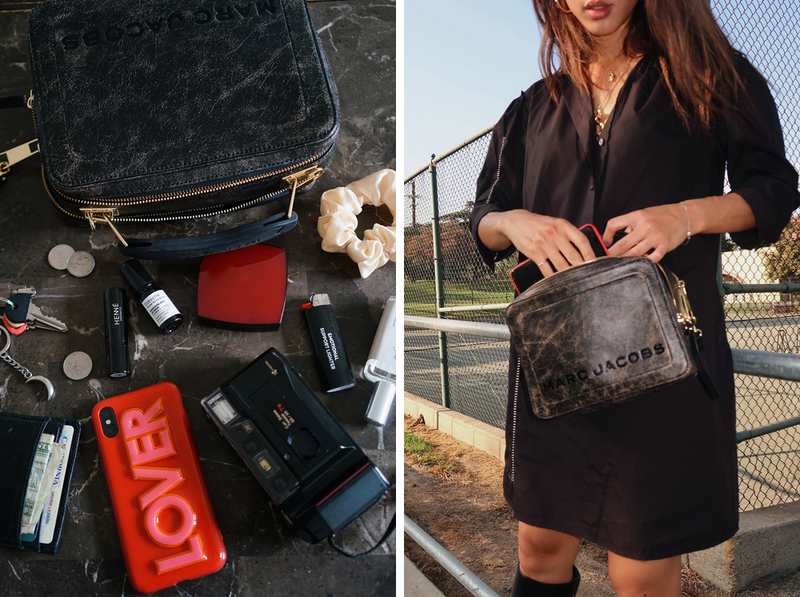 These pieces from the new Marc Jacobs collection do just that for me - the shift dress, undemanding but oversized and tucked in all the right places, with just the right amount of details, and the Box Bag's marbling effect that lends extra texture for good measure. I love the lunchbox shape of the bag especially - it surprisingly stores a ton of essentials and still maintains its smooth, eye catching shape. As someone who appreciates both art and form, I'm taking this bag with me wherever I go this season, day or night, for its understated look and genius utility. To go freely, to do things effortlessly. LOVE the boots! This outfit is gorgeous! !